I’m doing the Profile Lookup Function right now. 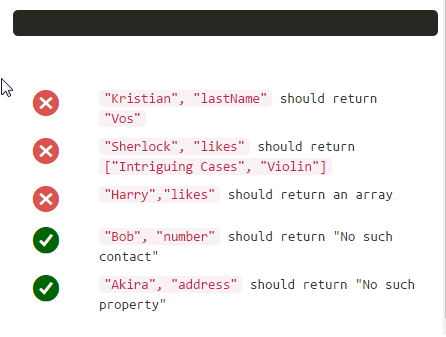 Where you have to find contacts in an json object. In the screenshot you can see the output (none) and the test cases (just 2 passes). Why are the other tests not passing? In my mind that function makes perfect sense. What did I do wrong? Yes that’s it thank you. I was just wondering because FCC Editor gave a warning “is better written in dot notation”.